With more than three-quarters of a million copies sold since its first publication, The Craft of Research has helped generations of researchers at every levelâfrom first-year undergraduatesÂ to advanced graduate studentsÂ to research reporters in business and governmentâlearn how to conduct effective and meaningful research. Conceived by seasoned researchers and educators Wayne C. Booth, Gregory G. Colomb, and Joseph M. Williams, this fundamental work explains how to find and evaluate sources,Â anticipate and respond to reader reservations, andÂ integrate these pieces into an argument that stands up to reader critique. Following the same guiding principle as earlier editionsâthat the skills of doing and reporting research are not just for elite students but for everyoneâthis new edition retains the accessible voice and direct approach that have made The Craft of Research a leader in the field of research reference. With updated examples and information on evaluation and usingÂ contemporary sources, this beloved classic is ready for the next generation of researchers. 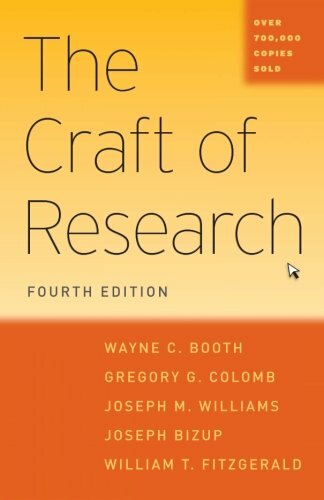 About: With more than three-quarters of a million copies sold since its first publication, The Craft of Research has helped generations of researchers at every level—from first-year undergraduates to advanced graduate students to research reporters in business and government—learn how to conduct effective and meaningful research.